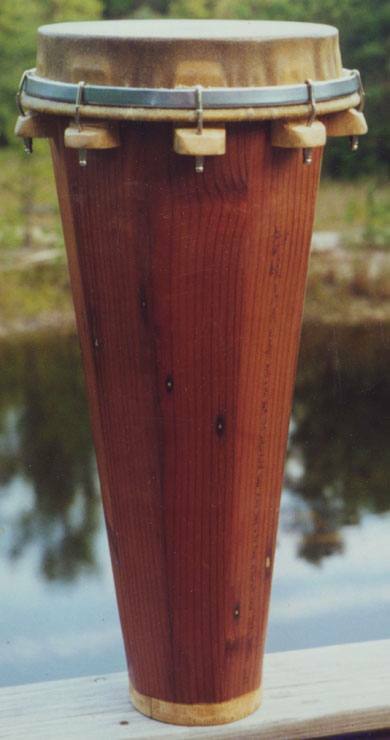 This was my second drum from scratch, made from recycled redwood deck two-by-fours and based – more than the Congone – on a conga made from 2x4s I once got to play. Built for a teacher friend who needs to stand up and play a lot, it stands about 60 cm high and is quite lightweight. The oak hoop and maple feet hold the banjo hooks and nuts that tighten the cowhide conga type head. Due to the ashiko-like shape we call it a congashiko.